On Jan. 20-23, instructors and directors of the voting membership of Drum Corps International will meet in Indianapolis to discuss several new rule proposals as part of DCI's annual winter business meetings. DCI.org columnist Michael Boo breaks down each of the items that will be considered and gives his insight and opinions on how passage of each rule might affect the direction of the drum corps activity. Drum Corps International's rules change process is an annual affair that kicks off each summer when proposal forms are distributed to the corps and judges. Once any submitted proposals are received by the Rules Change Committee in the fall, they are sent out to judges, directors and instructional staff members for review. At DCI's winter business meetings (Jan. 20-23, 2011 in Indianapolis) instructors will meet by caption in individual caucus sessions to discuss the proposals. One staff member from each eligible corps (World Class member corps and the previous season's Open Class finalists) will be polled to determine whether or not the proposal should be passed along to the full membership to debate, discuss and eventually vote on in the final round of the rules change process. Each of the proposals that are passed in the membership meeting will become part of the DCI rulebook, depending on implementation dates that are agreed upon by the voting members. Three proposals have been submitted for review this year. Vocal categories for Individual & Ensemble (I&E) competitions. in exhibition at the 2010 I&E competition. This proposal was submitted by Tim Rall, director of the Open Class 7th Regiment and Boston Crusaders Executive Director Tom Spataro. 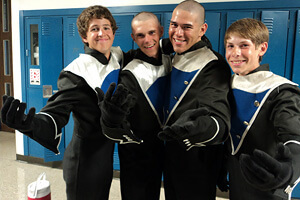 The proposal was presented at the urging of longtime Drum Corps World and DCI.org writer Christina Mavroudis. (Rules proposals can be submitted by anyone, but must be sponsored by at least one corps director.) This proposal would create two competitive classes at the DCI Individual & Ensemble competition; Vocal Solo and Vocal Ensemble, with the ensemble class being limited to 15 members. Performance duration would be the same as in the instrumental classes and participants must perform without accompaniment. Such an addition to the I&E schedule might allow for corps members not currently attracted to any of the other competitive captions to have (ahem) a voice at I&E. With today's multitalented corps members and the successes of television programs such as American Idol and Glee, singing has come out of the shadows and as such, has an attraction that wasn't apparent a few years ago. There is precedent for such a caption; a vocal ensemble caption has existed at the Drum Corps Associates Individual & Ensemble Competition for many years. It is hoped that such an addition to the I&E venue might help reverse some of the decline in participation among corps over the past few years. Possible discussion at the annual meeting is likely to include how to find adjudicators competent to judge a vocal caption, and it may possibly lead to discussion regarding how vocals are judged on the field (as to many it seems that there is no clear direction on what constitutes proper on-field vocal technique). It was suggested in the proposal that judges could follow the rules utilized by the Harmony Sweepstakes A Cappella Festival, a national event that attracts vocal ensembles from around the country. IPad or other remote device. David Glasgow of the Bluecoats submitted this proposal. 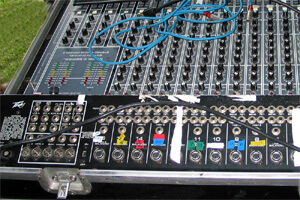 It seeks to alleviate restrictions on what tools a corps' sound engineer may utilize while operating a soundboard; in particular, it seeks to remove the rule that a soundboard cannot be adjusted via remote control (for example via an iPhone or iPad equipped with the appropriate software). Some may be surprised to learn that currently, rules allow for a corps staff person to communicate by cell phone or radio with a sound engineer operating the board on the field. This proposal would eliminate the middleman and allow a staff person to make adjustments directly from whatever vantage point in the stadium they deem appropriate, without additional verbal instructions that could interfere with the ability of members of the audience to fully enjoy the performance. The proposal also allows a staff member in the stands to control the balance of the music ensemble in real time instead of relaying instructions and waiting for the person on the field to make the adjustments, by which time it might be too late. It is believed by Glasgow that implementation of this proposal "will result in a better sounding, higher quality performance." Purchases of the required equipment would be at the discretion of the individual corps. While some may offer that this would only ramp up the A&E (amplification and electronics) arms race, Glasgow offers that most corps likely already have access to the necessary equipment. 1) It could be dismissed as something the directors just aren't ready or willing to spend time discussing. 2) It could generate a lot of discussion at the meetings, but due to the complicated nature of getting everyone to agree on what is entertainment, it could be tabled or passed along for discussion by a new rules systems task force, which is being developed under newly appointed DCI Artistic Director Michael Cesario. 3) A trial judging period could be established, with a separate set of judges taking the idea for a spin … their scores being analyzed but not counted toward the final scores at an event. 4) It could be passed pretty much as written in a "give the most vocal members of the audience what they want" festival of good will. 5) A combination of the first three scenarios could be implemented with the fourth scenario, in my opinion, being about as likely as a galloping herd of unicorns descending on Indianapolis in August. A major element of potential disagreement is the fact that everyone has his or her own concept of what entertainment is. It could be said that whatever someone finds to be entertaining is what he or she believes entertainment to be. But individualism being what it is, it's unlikely any group larger than one person, amidst judges or fans, can fully agree on what is or should be entertainment in drum corps. This proposal is fascinating on several levels and deserves to at least stimulate discussion on what is entertainment. And, as Shakespeare so articulately stated in Hamlet's famed soliloquy, "ay, there's the rub."